SACRAMENTO, California, December 13, 2014 (ENS) – After three dry years, rainstorms rolled across California this week, and heavy snow is forecast for the Sierra Nevada mountains. The drought-stricken state is finally getting some relief, but the precipitation comes with flooding, mudslides, power outages and howling winds. 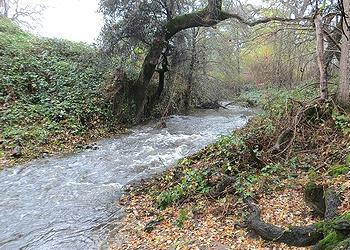 A major storm hit into California Thursday and Friday, dumping rain on parts of both Northern and Southern California. Thousands lost power as a result, and a tornado struck South Los Angeles Friday. No one was injured, but properties on several blocks were damaged, said the National Weather Service in Los Angeles. Los Angeles County officials said the rain brought 1.8 billion gallons of water to the region, which they said is enough to support 30,000 residents for a year. Rain fell on the agricultural areas of the Sacramento and San Joaquin valleys. Runoff from the storm will cause water levels to surge rapidly in streams and fill lakes and reservoirs. The water is a great relief to farmers, ranchers and everyone who drinks water in California. In January, Governor Jerry Brown declared a drought State of Emergency , with California facing water shortfalls after the driest year in recorded state history. From 1-3 inches of rain fell on coastal Southern California with an average of 3-6 inches of rain over central and northern parts of the state. Accuweather translates this rainfall to between 17 and 100 million gallons per square mile from this storm alone. “While more rain than what this single storm will deliver will be needed to end the drought completely, this will be a major step in the right direction. The ground will be thoroughly soaked,” said Accuweather meteorologist Alex Sosnowski. Up to several feet of snow fell prior to this week’s storms in the high country of the northern Sierra Nevada and southern Cascades. Yards of snow will fall over the higher terrain of these mountain ranges, which will be water in the bank for this coming spring and summer as it melts, Sosnowski said. Two more rainstorms are forecast to drench California before Christmas, but even more rain will be needed this winter to erase the longterm drought. WASHINGTON, DC, December 13, 2014 (ENS) – The San Carlos Apache Tribe in Arizona is fighting to stave off copper mining threatening historic Apache Leap, a sacred site in southeastern Arizona near the town of Superior that has been federally protected from mining since 1955. On Friday both houses of Congress passed the Southeast Arizona Land Exchange and Conservation Act as part of the National Defense Authorization Act. The bill gives Resolution Copper Mining, a subsidiary of the Australian-English mining firm Rio Tinto, 2,400 acres of the Tonto National Forest in exchange for 5,300 acres of other land parcels. Resolution Copper plans to mine a giant copper deposit, excavating the largest copper mine of North America. Congressional leaders made last-minute changes that include provisions for completion of a full Environmental Impact Statement before the exchange of title, protections for Apache Leap, and safe access to the Oak Flat Campground after the exchange has been completed. 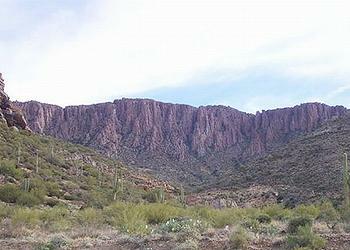 The Apache Leap site is sacred to the San Carlos Apaches and other tribes, including the White Mountain Apache, Hopi, Hualapai, Yavapai Apache, Camp Verde, and Tonto Apache. The land at issue would be subject to a technique called block cave mining that involves removing underground rock, creating the potential for a cave-in or landslide. This happened last year at a Resolution Copper-controlled mine in Utah, the tribes point out. Resolution Copper Mining project director Andrew Taplin maintains the new mine can be safe and will provide an important economic boost to the state. “Passage of the legislation means that Resolution Copper can move forward with the development of this world-class ore body which will create approximately 3,700 jobs, generate over $60 billion in economic impact and result almost $20 billion in state and federal tax payments,” he said. “There is much more work to be done before commercial mining can begin and Resolution Copper looks forward to working with all stakeholders as we continue to progress through the regulatory review process toward responsible development and operation of a world-class copper mine that will safely produce over 25 percent of the current annual demand for copper in the United States,” said Taplin. Once the legislation is signed into law by President Barack Obama, Taplin says Resolution Copper will focus on the comprehensive environmental and regulatory review under the National Environmental Protection Act, where there will be broad public consultation, government-to-government consultation with Arizona Native American tribes and a comprehensive valuation appraisal of the copper deposit as required by Congress. But the tribes have not given up. They are asking President Barack Obama to veto the Southeast Arizona Land Exchange and Conservation Act. A White House petition begun by San Carlos Apache Chairman Terry Rambler has garnered 49,468 as of 1:30 p.m. on Wednesday December 10. It needs 50,532 more to reach the petitioners’ goal of 100,000 by January 3, 2015. WASHINGTON, DC, December 13, 2014 (ENS) – Energy Secretary Ernest Moniz Friday announced the formalization of the Nuclear Energy Tribal Working Group (NETWG), providing a forum for tribal leaders to engage with the Energy Department on a wider scope of nuclear energy issues. NETWG formalizes the efforts of the Nuclear Energy Tribal Leader Dialogue, established by the Office of Nuclear Energy in October 2013. This discussion focused on the management of spent nuclear fuel and high-level radioactive waste, transportation and related emergency response planning activities, nuclear research and development, small modular reactors, and potential economic business opportunities. “Through the Nuclear Energy Tribal Working Group, the department hopes to incorporate the unique and important perspectives from tribal leaders as we continue to develop and deploy safe, reliable, and efficient nuclear power,” said Moniz. 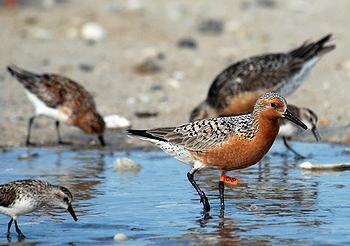 knot, a robin-sized shorebird, designating it as “threatened” under the Endangered Species Act. The bird is at risk of extinction from the impacts of climate change and development across the Americas. “The red knot is a remarkable and resilient bird known to migrate thousands of miles a year from the Canadian Arctic to the southern tip of South America,” said Service Director Dan Ashe. Since the 1980s, the knot’s population has fallen by about 75 percent in some key areas, largely due to declines in one of its primary food resources – horseshoe crab eggs in Delaware Bay, an important migratory stopover site. Although this threat is now being addressed by extensive state and federal management actions, other threats, including sea-level rise, some shoreline projects and coastal development,continue to shrink the shorebird’s wintering and migratory habitat. Changing climate conditions are altering the bird’s breeding habitat in the Arctic and affecting its food supply across its range. Climate-driven mismatches in migration timing that affect the peak periods of food availability are a major problem. The bird must arrive at Delaware Bay at exactly the time when horseshoe crabs are laying their eggs. In making its decision, the Service analyzed the best available data in more than 1,700 scientific documents, and considered issues raised in more than 17,400 comments provided during 130 days of public comment periods and three public hearings. Protections under the law will take effect 30 days after publication in the Federal Register. As required by the Endangered Species Act, the Service is reviewing the U.S. range of the rufa red knot to identify areas that are essential for its conservation, known as critical habitat. The Service expects to propose critical habitat for public review and comment in 2015 after the required review of economic considerations. Visit http://www.fws.gov/northeast/redknot/ to read the final rule and response to comments; view and download video, photos and maps; and explore more resources, such as an interactive timeline and infographic. The rule is available at www.regulations.gov, under docket number FWS-R5-ES-2013-0097. ANCHORAGE, Alaska, December 13,2014 (ENS) – Arctic ringed seals threatened by climate change could be granted protected habitat extending across 350,000 square miles in Alaska’s Bering, Chukchi and Beaufort seas, an area more than twice the size of California. The critical habitat proposal from the National Marine Fisheries Service, announced December 2, would be the largest such designation in history. Upon designation of a critical habitat area, federal agencies are required to consult with NOAA Fisheries on actions they authorize, fund, or carry out to ensure their actions are not likely to destroy or adversely modify that critical habitat. Designation of critical habitat would not affect subsistence harvest of ringed seals by Alaska Natives. Critical habitat provides key protections for listed species by prohibiting federal agencies from permitting, funding, or carrying out actions that “adversely modify” designated areas. At the same time, Shell Oil continues to press for drilling permits in ringed seal habitat. Species with designated critical habitat are twice as likely to be recovering as those without, says the nonprofit Center for Biological Diversity, whose petition for listing of ringed seals under the Endangered Species Act in 2012 resulted in that federal protection. 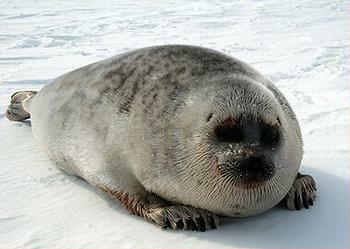 Ringed seals, primary prey for polar bears, excavate snow caves on sea ice to shelter nursing pups. As the Arctic warms, the sea ice is breaking up earlier. Rain falls on the snow, causing the snow caves to collapse – as a result ringed seal pups are dying in unprecedented numbers. This year’s summer sea ice reached its sixth lowest level on record; the lowest level was recorded in 2012, when the sea ice only reached half its average size. Scientists predict that the Arctic could be ice-free in summer before mid-century. There will be a 90-day public comment period on the proposal and NOAA Fisheries will soon announce locations and times for public hearings. The agency will consider comments received as it develops the final critical habitat designation. WASHINGTON, DC, December 13, 2014 (ENS) – Americans Against Fracking, along with over 40 national, state, and grassroots organizations, are condemning Maryland Governor Martin O’Malley’s decision to lift the moratorium on fracking in Maryland. Hydraulic fracturing, or fracking, involves horizontal drilling and the fracturing of underground shale rock with pressurized water and chemicals to release deposits of gas and oil. On the Tuesday before Thanksgiving, outgoing Maryland Governor O’Malley, a Democrat, announced that his administration would release regulations on fracking. He said fracking can be done safely if energy companies are governed by the “best practices” of other states and nations where fracking is permitted. The regulations are expected to include restrictions on drilling locations and attempts to limit drinking water contamination and air pollution. In their letter, delivered to the governor’s office Monday, the 40 groups contend that even the best regulations will not ameliorate all the risks associated with fracking, and that there should be no acceptable level of contamination allowed in Maryland. The signatories include Progressive Democrats of America, Democracy for America, DailyKos, Food & Water Watch, MoveOn.Org Civic Action, Center for Biological Diversity, Friends of the Earth, Public Citizen, and Environmental Action, and Environment America. They criticize the timing of the announcement, as O’Malley released the state’s final fracking report only one week after the comment period closed on a critical risk assessment, leaving too little time to consider the more than 6,000 public and technical comments submitted. The groups argue that the fracking decision was not based on science, but on O’Malley’s presidential ambitions. The environmental groups say the decision is out of step with the desires of most Marylanders and most Americans. A recent Goucher poll showed that 58 percent of residents familiar with fracking believe that the process is harmful to the environment; 52 percent of those familiar with fracking support a ban. A Pew poll issued this November found that a 47 percent plurality of Americans, 59 percent of Democrats and 53 percent of Independents nationally oppose increased fracking. The fracking rules would not take effect until after O’Malley is succeeded by Governor-elect Larry Hogan, a Republican, who has criticized the governor for taking last-minute action on fracking and other controversial issues. CHARLOTTESVILLE, Virginia, December 13, 2014 (ENS) – The majority of streams in the Chesapeake Bay region have warmed by more than 2.5 degrees Fahrenheit since 1960, according to new U.S. Geological Survey research. The increase appears to be driven by rising air temperatures, the scientists said. In a study published in the journal “Climatic Change,” USGS researchers found an overall warming trend in air temperature of 0.023 Celsius (0.041 Fahrenheit) per year, and in water temperature of 0.028 C (0.050 F) per year over 51 years. This means that air temperature has risen 1.1 C (1.98 F), and water temperature has risen 1.4 C (2.52 F) between 1960 and 2010 in the Chesapeake Bay region. “Although this may not seem like much, even small increases in water temperatures can have an effect on water quality, affecting the animals that rely on the bay’s streams, as well as the estuary itself,” said Karen Rice, USGS research hydrologist and lead author of the study. One effect of warming waters is an increase in eutrophication, or an overabundance of nutrients. This problem has plagued the bay for decades and likely will increase as temperatures of waters contributing to the bay continue to rise, said Rice. Other effects of warming waters include shifts in plant and animal distributions in the basin’s freshwater rivers and streams. Upstream waters may no longer be suitable for some cool-water fish species, and invasive species may move into the warming waters as those streams become more hospitable. The study examined 51 years of data from 85 air-temperature sites and 129 stream-water temperature sites throughout the bay watershed. Water temperature at most of the sites examined increased from 1960-2010. “Our results suggest that water temperature is largely influenced by increasing air temperature, and features on the landscape act to enhance or dampen the level of that influence,” said John Jastram, USGS hydrologist and study coauthor. As future air temperatures rise, so will water temperature in Chesapeake Bay, the scientists said, though mixing with ocean water may buffer it somewhat, cooling the warmer water entering from the watershed. Chesapeake Bay is the largest estuary in the United States, with a watershed covering 166,391 square kilometers (over 64,243 square miles) that includes parts of New York, Pennsylvania, Delaware, Maryland, Virginia, West Virginia and the District of Columbia. The watershed includes more than 100,000 streams, creeks and rivers that thread through it, and it supports more than 3,700 species of plants and animals. The states and DC are working with the federal government to improve conditions in the bay and its watershed and address the threats from climate change.